Roadtrips. You either love them or hate them. Either way, roadtrips are one of the best ways to explore much of a country in a short amount of time. And what better landscape to explore than the rolling mountains, lava fields and glacial lakes found along the Iceland Ring Road? Route 1, also known as the Iceland Ring Road, encircles the entire island with over 1,280 kilometers of tarmac and uncountable photo opportunities. If you’re looking for the perfect place to hit the road with your bestie, look no further than an Iceland road trip. There’s so much to see in Iceland that it can sometimes feel a little overwhelming trying to fit everything in. The great thing about a road trip is that you save travel time driving backwards and forwards from your static accommodation. That being said, an adequate Iceland road trip can’t be rushed. 7 days is the general consensus on how long it will take you, and even then, you might feel like you need more time! So, where to get started? Reykjavik is the obvious option. There is Keflavik International Airport and plenty of car rental options there. However, Akureyri is Iceland’s second-biggest urban center, found in northern Iceland, and it also has an international airport. As the plan is to make a complete circle on the ring road, the choice is really up to you. Do keep in mind, though, that Akureyri does have fewer options when it comes to car rentals. 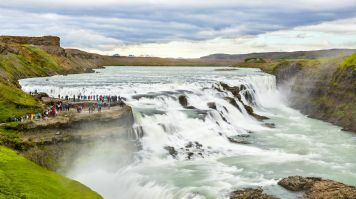 Thingvellir National Park, Geysir and Gullfoss waterfall. This is the perfect one-day mini road trip and is a great way to get started for the week! Stay at Hotel Geysir in the traditional hotel, cottage or campsite. Camping is also available within Thingvellir. 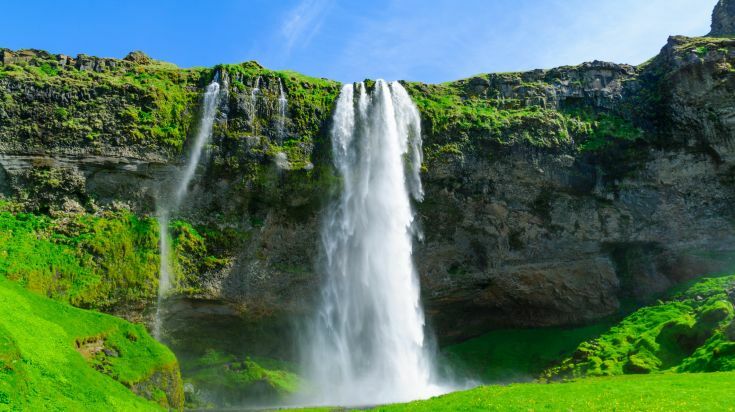 Seljalandsfoss and Skogafoss are both majestic waterfalls in Iceland not to be missed, and also within an easy distance of each other. Tackle part of the Fimmvörðuháls trail (the entire hike takes more than 12 hours). Stay in the nearby coastal village of Vik which offers hotels and hostels for every budget. Start the day at Reynisfjara shore, the famous black sand beach close to Vik. 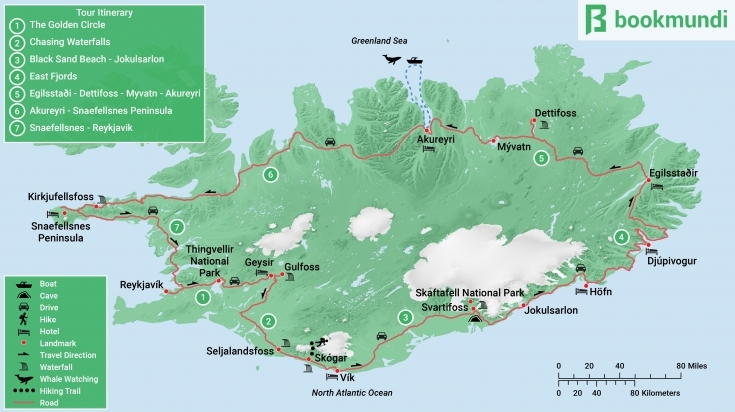 Then head to Skaftafell National Park and hike to Svartifoss waterfall or visit an ice cave. Finish the day back on the shores of Jokulsarlon glacial lagoon and find a place to stay in Hofn which has hotels, guesthouses and a hostel. Did you know that Jokulsarlon glacial lagoon is the filming location for many hits like the James Bond and Lara Croft movies? This place surely has to be special! Check out tours that take in this destination here. This is a day for a great mixtape, lots of snacks and taking in the views going past your windows. Expect rugged mountains, black sand beaches and lots of sheep and deer. Keep an eye out for herds unexpectedly crossing roads! Pitstop towns include Djupivogur and Egilsstaði. Egilsstaði has the Hallormsstadur hotel in the middle of a forest. 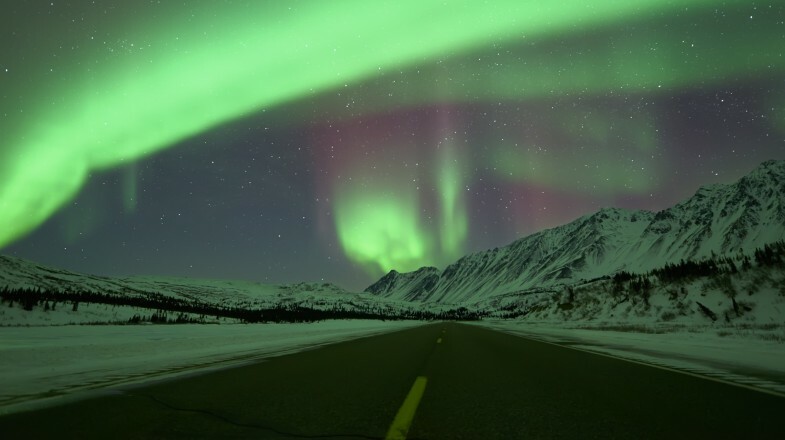 The East Fjords are a popular place to view the Northern Lights. Before driving to Myvatn, make a detour to Dettifoss. The biggest waterfall in Europe (by volume), you won’t be disappointed. Myvatn then offers a variety of geothermal activity such as volcanoes, geysers and hotsprings. Finish the day in Akureyri, which has a great number of accommodation options. 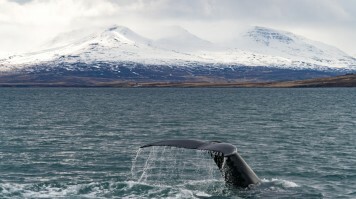 Akureyri is the whale watching capital of Europe. After sailing the seas to spot a rare blue whale, hit the road again and head to Snaefellsnes Peninsula. There you’ll find abundant choices for accommodation. Lýsuhóll-Snæhestar cottages, Grundarfjörður hostel, Traðir guesthouse, Ólafsvík camping ground and Hotel Fransiskus are just a handful of options in the area. Spend the day exploring all the Snaefellsnes peninsula has to offer. For example, the picture perfect Kirkjufellsfoss Waterfall and surrounding trails. Finally, make the 2-hour trip back to Reykjavik. Want to know what else the otherworldly Snaefellsnes Peninsula offers? Check out the tours here! Still waters run deep. At 250 meters, Jokulsarlon is Iceland's deepest lake. As you can see, a 7 day Iceland roadtrip has a jam-packed schedule. If you can spare an extra couple days, stretching the Ring Road trip out to 10 days will allow you more freedom with your schedule. For example, an extra day in Reykjavik will give you enough time to visit the famous Blue Lagoon. History buffs will enjoy exploring the Laufás turf houses in Akureyri – a prime example of how ancient Icelanders lived in the 1800s. Or take the time to venture into the West Fjords and hike up to Fjallfoss waterfall. In East Iceland, the Thorbergur center is a cultural center in Hofn dedicated to the beloved Icelandic author Thórbergur Thórdarson. It also has a restaurant that serves especially fresh fish. If you find yourself with some spare time on your Golden Circle day trip, head to nearby Kerid crater. 55 meters deep with a blue lake at the bottom, this 3,000-year-old crater makes for a picturesque hike. The ring road is accessible year round. However, smaller, gravel roads that lead to certain attractions, such as Hverfjall crater, are closed off during the winter months. The summer months of July and August will give you the best weather conditions for driving and enjoying the stops along the way. For the high-season in summer, be sure to pre-book accommodation. Spring and autumn (April/May and September/October) are also viable options and will help you avoid the summer crowds. Winter, between November and March, can be dangerous and should generally be avoided. For more information on the weather, please read our guide on the best time to visit Iceland. Most roads are accessible by regular cars. However, a larger jeep style car or 4x4 is a good option for such a long trip through the Icelandic countryside. If you’re planning to delve into the highlands along the East Fjords then it is essential. Another transport option that can also save you money on accommodation is a camper van. This will allow you total freedom away from reservations and check-in/out times. You can rent camper vans via car rentals in Reykjavik. Gas stations are dotted along the ring road but it’s best to fill-up wherever possible to avoid an emergency. Keep in mind that gas isn’t cheap, so a diesel car may be a more economical option. It’s a good idea to stock up on snacks and essentials before you leave your starting point of Reykjavik or Akureyri. However, like gas stations, there are convenience stores located in towns you will pass through on the ring road. And, of course, you can find a hot dog just about anywhere in Iceland. Key things to buy in bulk are water and toilet paper. Thank us later. GPS is vital in Iceland as there are long stretches of road where you will be completely alone. It might take a while before you find anyone to ask for directions! Buying a prepaid Iceland SIM card will give you access to internet data, GPS, emergency services and a way to keep your loved ones up to date on your trip. It’s important to leave someone with your itinerary so they are aware of your travel plans and can alert the authorities if there is a problem. The website www.safetravel.is is a place where you can submit your travel plan and relevant information for ICE-SAR to begin a search and rescue if anything should go wrong on your trip. Iceland’s weather can change in an instant, no matter the season. Be sure to pack adequate clothing that consists of lots of layers. Don’t forget your hiking boots and waterproof clothing. Also be sure to pack a complete first aid kit and a torch in case of emergency. 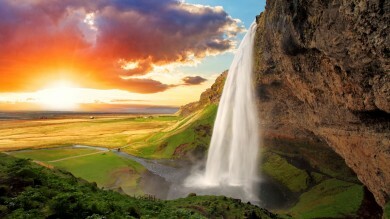 The feisty Seljalandsfoss is one of the major attractions of Golden Circle tour in Iceland. It shouldn't be missed. There you have it, the perfect Iceland road trip! 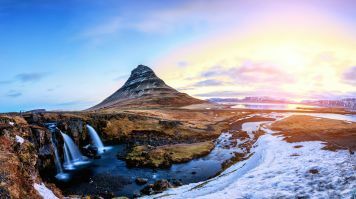 Iceland really has a magnificent number of attractions and activities to get stuck into, so spend some time deciding what makes the cut. Plan for the trip of a lifetime, but also make sure you stay safe. Finally – get started on that epic Iceland ring road mixtape and get going! Hi, I need help with 4.5 days itinerary in Iceland, 7/6-12/6 (arriving 7/6 mid day, and leaving 12/6 early morning). My idea was: 1st night - Reykjavik; 2nd night - Vik; 3rd night - Hofn; 4th night - Akureyi; last night - Reykjavik. Is that doable? Many thanks! The itinerary that you have described does sound doable. 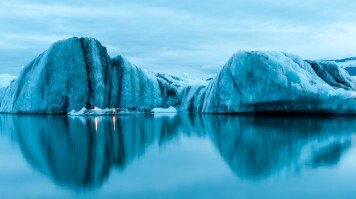 Our travel experts in Iceland will be able to craft an amazing itinerary as per your travel requirements. Will you be interested in exploring this option? 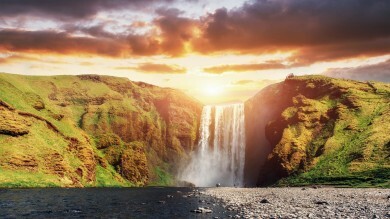 If yes, kindly send us a trip planner request via this link: https://www.bookmundi.com/trip-planner?country=Iceland#/grouptype and we will connect you with a suitable travel operator. Sounds good?